We have tried to keep this page as updated as possible. so that we can update our records. There was a Celebration of Life held for Louis P. Davis ‪on February 2nd, 2019‬. Pete marched with Blue Rock in 1970 & 1971. Following Blue Rock, Pete also worked with several corps including the Crossmen and the Hurricanes and judged for the NJA. Peter T. Coyle “Pete” of Drexel Hill, died October 9, 2018 at the age of 65. He was the beloved husband of Debra A. (nee Grubb) Coyle and loving father of Leila Brynn Coyle. He was predeceased by his father Peter S. Coyle and is survived by his mother Mary T. (nee McGrath) Pint and her husband Robert Pint, a brother Dennis (Susan) Coyle and a sister Noreen (Robert) Yoder. He was also predeceased by his mother-in-law Mary Ellen (nee Logan) Grubb, sister-in-law Donna Grubb and nephew Ryan Coyle. He is also survived by his father-in-law D. Allyn Grubb and his wife Josephine Grubb, sister-in-law Judith Grubb brother-in-law David (Christa) DeAngelis, nieces and nephews; Katie (Patrick) Miller, Emily, Noah and Abe Yoder, Brianna, Christian and Anya DeAngelis and many other loving family and friends. In lieu of flowers, donations in Pete's memory can be made to the Upper Darby Arts & Education Foundation. 601 N. Lansdowne Avenue, Drexel Hill. PA 19026 or the Asana Hospice & Palliative Care, 300 Johnson Avenue, Ridley Park, PA 19078. Newark - Earl G. Panaro passed away unexpectedly at age 72 on Monday, June 11, 2018. Born in Wilmington on October 18, 1945, Earl was a graduate of Salesianum School, class of 1963, and was a proud veteran of the United States Navy, having served in active duty from 1965-1967 and as a reservist until 1971. Earl was employed with the United States Postal Service and retired in 2000 after 32 years of dedicated service. Throughout his life, Earl enjoyed many interests and hobbies. He had a talent for the french horn and performed with the Blue Rocks Drum and Bugle Corps. He enjoyed playing tennis and was a mixed doubles state champion. On any given day or evening, Earl could be found having a great time at Delaware Park, trying his luck at the roulette wheel or RedHots. He also enjoyed his membership at the Newark Senior Center, where he socialized and participated in the weekly dance night. As a passionate and talented dancer, Earl won many awards and was proud to be featured in YouTube videos "Earl and Kristy". Earl possessed a great sense of humor and was always cheerful and upbeat, never having a bad day. Earl will be dearly missed by his sister, Christine Panaro Schneider and her husband, Mark, who lovingly cared for him these last couple of years. He is also survived by his brother, Daniel J. Panaro, Jr. "Butch"; his many nieces and nephews; and cousins. He was predeceased by his parents, Daniel J. Panaro, Sr. and Anna May Panaro Racine; his sister, Mary T. Willett and her husband, George. We were notified that Paul Riccelli who marched the "big corps" with his sister Anita and brother Steve from 1972 through 1974 passed away this morning from heart complications at his home in Estes, Florida, at the age of 62. Further details will be shared as received. More information will be published as received. Beloved husband of 44 years to Patricia A. Quackenbush (nee Cattell). Dear father of Thomas J. Jr. (Kate) and Patrice L. Quackenbush (Richard Carey, Jr). Loving PopPop of two grandsons, Benjamin and Richard. Brother of Charles (Valerie) Quackenbush and Merle Pilivjian. He is also lovingly survived by many nieces and nephews. Tom was a graduate of Penns Grove High School and Gloucester County Community College. He was a member of the Blue Rock Drum and Bugle Corp, an avid golfer and former Audubon Youth Soccer coach. He was a longtime resident of Barrington, NJ, dedicating many years of service to the Barrington Democrat Club and was a former democratic county chair. Tom spent most of his career in the banking industry and most recently worked with the environmental protection service of Camden County. Tom also was a longtime member and chairman of the Joseph L. DeMarco III Memorial Scholarship Golf Tournament committee. William J. "Bill" Kitchen, age 93, of New Castle, DE, passed away peacefully at home on Saturday, February 24, 2018 with family by his side. Passed away suddenly on Monday November 27, 2017. He was 66. Michael was born in Philadelphia to Frances (Muni) and John McCauley. Michael is survived by his loving wife of 35 years, Norma (Blank); his step children, Susan Zlakowski (Alex), Sandi Hild (Bruce), Edward Stagemyer (Sherri), Kenneth Stagemyer (Karen) and Marie Saylor (Gerald); 12 grandchildren and great- grand-children; and a brother, John McCauley (Toni). Michael was preceded in death by his step son, Ronald Stagemyer. Michael marched in the Blue Rock Drum and Bugle corp as a teen. He was employed by International Paper company for 20 yrs. He was a printer at PNI newspapers before he retired four years ago. He enjoyed fishing and photography and spending time with family. He was the love of Norma's life. Robert J. McGowan, age 94, a lifelong resident of the Carneys Point area, passed away on September 26, 2017. Bob served his country during World War II in the United States Navy and spent his career working as an accountant for DuPont Chambers Works in Deepwater. He was a member of the Blue Rock Senior Drum and Bugle Corps and was a founding member of the Junior Drum and Bugle Corps. Bob is remembered as a hard worker and a devoted family man, whose door was always open to anyone. He had a great sense of humor and could always say something that would make you laugh. He also enjoyed traveling and polka dancing. Bob is survived by his loving wife, Sarah (Atkinson) McGowan; his daughter Janis Sylvester of West Long Branch, NJ; his grandchildren Christina Triano (Anthony), Lauren Schiavone (Thomas) and Kenneth Sylvester; his great grandchildren Shae Mila Triano, Theresa, Brittany and Jonathon Schiavone and Robert and Sean Sylvester; and his niece Fran Marandola. He was predeceased by his mother Violet (Dunk) McGowan; his sister Grace Leister and his son-in-law Norman Sylvester. Wappingers Falls - Morgan, Donna L. Haas, of Wappingers Falls, entered into rest Thursday, December 8, 2016 at home. She was 57. Donna was an inspiration to those that knew her, having fought brain cancer with strength, courage, peace and her strong faith. Born June 30, 1959 in Levittown, PA., she was the daughter of the late Charles and Jacqueline Krapf Haas. Donna was a self-employed Bookkeeper. Survivors include: her husband, Gregory Morgan, and son, Benjamin Morgan at home; sisters Theresa Haas of Cedar Grove NJ, Christina Haas of East Stroudsburg PA, and Diana and her husband David Irvin of Fredericksburg PA; her brother, Michael Haas and his wife Susan of Newtown PA; her mother-in-law, Kathryn Morgan, of Fishkill; two brothers-in-law, Jeffrey Morgan and his companion Patricia Williams of Lagrangeville, and Shawn Morgan and his wife Lisa of Poestenkill NY, as well as several nieces and nephews. Donna and her siblings had grown up in the drum and bugle corps activity. Throughout her life, she had performed with drum corps to include the Bracken Cavaliers, Blue Rock, NY Skyliners, 20th Century Ltd., Fusion Core and the Caballeros Alumni. In addition to meeting her husband in drum corps, Donna was extremely proud to watch their son, Ben, grow and flourish in the activity. Donna also leaves behind countless friends and family in the drum corps activity. A memorial visitation was held Wednesday, December 14,2016 from 2:00 to 4:00 and 7:00 to 9:00 PM at Libby Funeral Home, 55 Teller Ave., Beacon, NY. A memorial Mass was Thursday, December 15, 2016 at 11:00 AM at St. Joachim's Church 51 Leonard St. Beacon, NY. It is with great sadness that I report the passing of Frank Haddaway. Frank played snare drum with the Blue Rock Drum and Bugle Corps from 1958 to about 1962. Frank and I met when I joined Blue Rock in 1959. Frank went on to march with the Air Force Drum and Bugle Corps at Bolling Air Force base in Washington, DC. In those days the A.F. D & B C was directed by none other than M/Sgt. Truman W. Crawford. Frank always told me how honored he was to March with some of the finest talent anywhere! He went on to start a corps in Kansas and also played the cadence for the funeral of President John F. Kennedy as it proceeded through the streets of Our nations capital. We often argued politics and would go off line and talk about it. 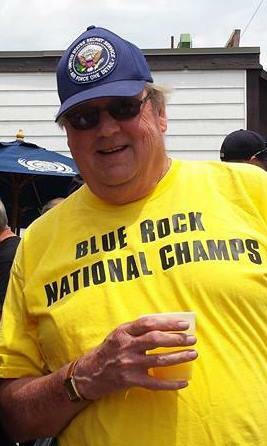 We are sad to report the passing of Blue Rock alumnus Bruce Boyes. Bruce was best known as a soprano horn. However --- perhaps not as well known --- he also spent some time as a snare drummer. 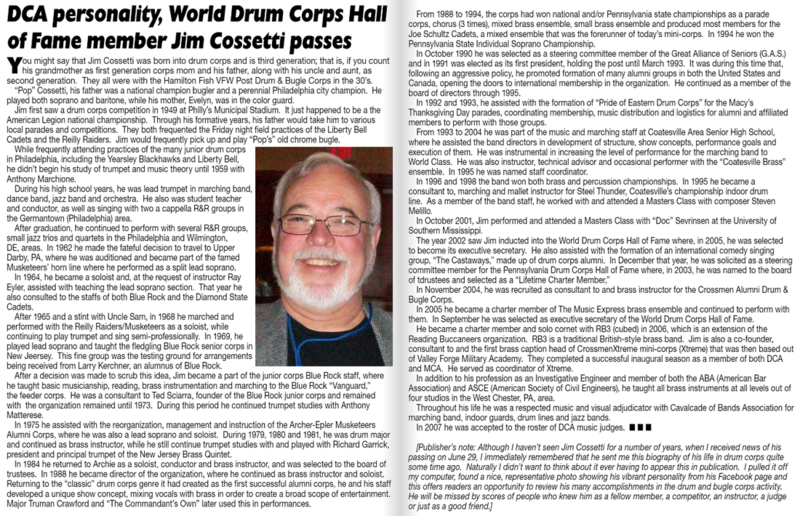 This is to say that he was certainly very talented and well-rounded in our world of drum corps. But best known as a lead soprano, he was no doubt top-notch in that role, and as one of Blue Rock’s best-ever soloists. But Bruce was not the boisterous showman --- but rather the subtle professional. No mistaking his talent and abilities, he was more the consummate musician, choosing to pursue purity and perfection in technique and performance. Perhaps not so adulated, he was much more admired and respected for those qualities. In those days when Blue Rock aspired to climb to higher levels of quality and achievement, Bruce was at the forefront of that effort, and was one of the sincerest and most dedicated to those goals. Dear friend --- we will miss you. 11/16/53 to 6/24/16 SAN CLEMENTE, Calif. - Sharon was a beautiful woman with an even more beautiful soul. She loved to laugh, dance and play golf as a member of the San Juan Hills Country Club. She was born in Wilmington and she later graduated from Thomas McKean High School, where she took part in the Blue Rock Drum and Bugle Corp.
Sharon's life took her to many exciting places, including San Clemente, Calif., where she spent the rest of her life with the love of her life near the beach. Sharon was recently diagnosed with Stage 4 pancreatic cancer, and while she continued to smile, her condition was more than she could handle. On Friday, June 24, 2016, Sharon's pain ended and she returned to Heaven as all Angels do. She passed away comfortably in her home as she was being cared for by her husband and daughter. She was surrounded by her closest family and friends. Sharon is survived by her husband, Bruce C. Tripp; daughter, Breana B. Paaverud; mother, Evelyn C. Burnstein; brothers, John K. Warren and Douglas F. Warren; sisters, Dianna L. Miller and Alison T. Burnstein; nephew, Micheal T. Paaverud; four grandchildren; and many more family and friends. Diane Reha Fromal, age 57, of Claymont, DE passed away suddenly on September 6, 2015. Diane was formerly employed at Blue Cross Blue Shield. She graduated from Claymont High School in 1976 and was a graduate of Harris School of Business. Diane was a Phillies and NASCAR fan. She also loved animals. Diane is survived by her parents, Beverly and Albert Reha; her twin sister, Joanne Reha (Ron Shadwell); and her son, Aaron Fromal. Cindi Wawrzynaik Sonntag marched with Blue Rock from 66-69 as member of the color guard, rifle and flag. She was a true Blue Rocker and made many good friends along the way...Betty Ann being one of them..loved the corps and everything we all shared along the way. Life then moved on as she raised two beautiful daughters. I know that her husband Mike and daughters very much appreciate your thoughts and prayers. Cindi will be cremated in Orlando Florida with a church service at Corpus Christy Catholic Church. 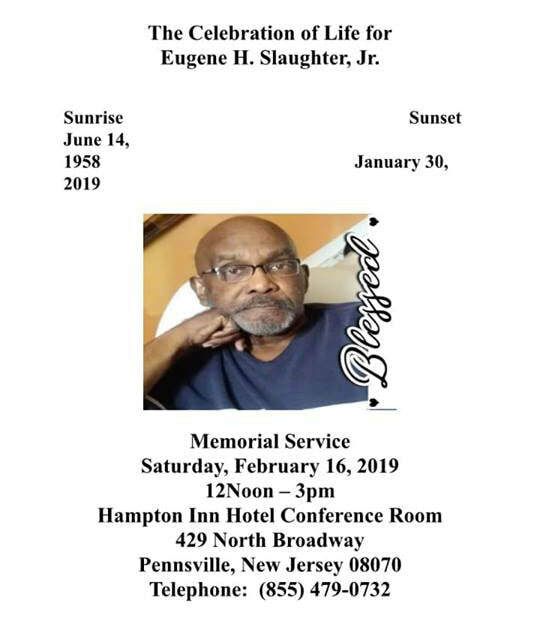 Francis W. Burden Sr. Pennsville, NJ Francis W. "Frank" Burden, Sr. age 68 of Pennsville went home to be with the Lord on Thursday July 2, 2015 at his home. Son of the late Calvin F. and Esther (nee Ludlam) Burden, he was raised in Pennsville and had been a lifelong Salem County resident. Sergeant Burden served three tours in Vietnam (1966-67-68) with the United States Marine Corps. He worked on the railroad as a locomotive engineer. 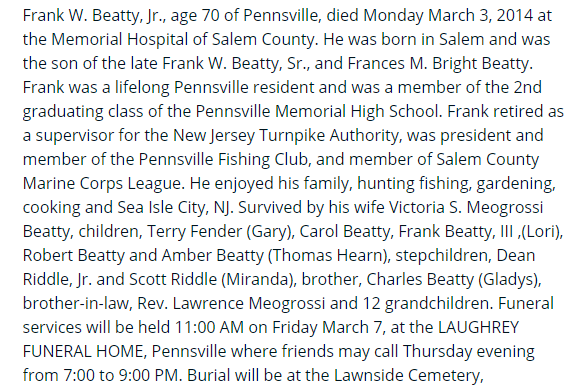 Frank was a life member of Carneys Point Fire and Rescue where he had been an EMT and Fire Police, he had also been an EMT with the Pedricktown First Aid Squad and Penns Grove Ambulance, had served with the Salem County Fire Police where he had been a past chief and had been a life member of the State Fire Police. He was also a member of the Blue Rock Drum and Bugle Corps. Bill Martin has posted that Larry Sorensen (one of the Troy boys) has passed away after suffering from diabetes for many years. Larry played snare drum for Blue Rock in 1973-74. Larry never married and had no children. A mass will be held at St Augustine's church on Monday at 9am in Troy, NY. He was a band musician all of his life. A mass was offered on Monday, July 6th, at St. Augustine's church in Troy, New York. Mike Nilan, of Somerset, passed on March 24, 2014 at the In Touch Hospice House. Born July 20, 1946 in Philadelphia, he is a son of the late William and Anna Marie (O’Neill) Nilan. He is survived by his daughter Kelly Buckley and husband Patrick; son Michael J Nilan Jr.; their mother Kathleen Nilan; and sisters Anna Conrad and Joanne Mills. Michael was a drum corps enthusiast, playing for Blue Rock Drum Corps among others in the Philadelphia area. He was loved by many and touched the lives of countless people throughout his journey. Mrs. Sharon Ann Sutton Black, age 54, of Jacksonville, died March 9, 2014 at UNC-Chapel Hill Hospital. A Graveside Service will be held 12pm Friday, March 14, 2014 at Coastal Carolina State Veterans Cemetery. Mrs. Black is survived by her husband, Michael “Mike” Black of the home; a son, Robert Michael Black and a daughter, Rachel Michelle Black both of Jacksonville; her father, Robert Sutton and step-mother, Patricia Sutton of Napa Valley, CA; brothers, Craig Sutton of San Antonio, TX and Eddy Sutton of Fort Worth, TX. Mrs. Black is a United States Navy Veteran. Lawrence Williams, 63, of Carneys Point passed away on February 22, 2014 at home. Born in Salem County, Larry was the son of the late Hiram Aaron Patrick Williams & Pauline Mary Williams (nee: Hadfield). Larry has spent his entire life here in Salem County starting out in Deepwater were he was raised. A huge history buff, he enjoyed reading and studying everything to do about history, especially World War II. Larry was also a very passionate Philadelphia Sports Fan. He was a four for four guy, but the Eagles and Phillies top his list. A graduate from Penns Grove High School in 1969, Larry was also a member of their Basketball team that won the Championship in 1968. Although Larry had many interests and hobbies, the two things that came before anything else was his love for family and country. His wife Joann (Balsamo) Williams, children, Jeffrey M. Williams (Stacey), David L. Williams (Kelli), Christen M Williams (Melissa) and Hope R. Williams (Lois), grandchildren, Mark, Katie, Nicholas, Ted, Payton, Ryan, Noah, Colton and Paisley, sisters, RoseMarie Steinhauser (nee: Williams) and Carole Ann (Chamberlain) Meiring (nee: Williams) as well as many nieces, nephews and friends survived him. In addition to his parents, his brothers, Paul Williams, Walter Daniel Williams, Lloyd Hiram Williams and Richard Quinten Williams predeceased him. Born in Elkton, Maryland on February 5, 1952, Wesley was the son of the late William Henry Butler and Ronayne Dolores Lynch Butler. He joined the US Navy at the age of 16, and was honorably discharged in January of 1976. He also served as a member of the Delaware Army National Guard until 1975. Wesley made his career as a truck driver, working for various companies, including Young Lumber. He later worked at Home Depot as a sales associate. An avid reader, Wesley was especially fond of science-related periodicals. He loved playing with remote control cars, planes, and boats. He was a devoted husband and father, who adored spending time with his family. He is survived by his beloved wife of 38 years, H. Doreen Woods Butler; sons, Wesley Alan Butler, Jr. and Joshua Butler; sister, Dana Matthews and husband, Fred; and many nieces and nephews. In lieu of flowers, memorial contributions in Wesley's name may be made to Seasons Hospice of Delaware, 220 Continental Drive, Ste. 101, Newark, DE 19713..
We are sad to report to announce that Sharon Williams, Blue Rock color guard alumni, passed away at her home on Sunday, July 14th. Sharon marched with the corps in the early 1970's. Born in January of 1955, Sharon grew up in Richardson Park, DE. She graduated from Conrad High School in 1973 and was active in the Blue Rocks Drum Corps. She enjoyed fishing, auctions, and genealogy. There was nothing Sharon loved more than spending time with her grandchildren. More information, including times of services, is available by clicking here. Hello Friends: I was just told by Betty Ann that her mom passed away on Sunday, March 17. Having struggled through some recent surgeries, she passed peacefully in her sleep at home. She is pre-deceased by husband Bill. Angela “Angie” Long was a member of the original Blue Rock Senior Corps in the late 1950s. It was there she met and married Bill Long, a baritone horn player. When the BR Seniors folded, he joined the Archer-Epler “Musketeers” in Upper Darby, PA, and Angie was always with him at all corps activities. She worked for 40 years as a cashier in the employee cafeteria at DuPont in Wilmington, Delaware. bottle, first-aid kit, or wherever she was needed, and cheering the corps on in competition. When not doing drum corps, Bill and Angie enjoyed relaxing at their get-away cottage in Wildwood, New Jersey, and in later years were glad to have grandson Justin spend many happy times with them there. As the family wishes, services will be private. A native of Southern New Jersey, currently of Mantua, formerly of Pennsville passed away on October 12, 2012. Bob is survived by his wife Renee, mother Emma, brothers AJ and Jeff Spino. As well as his step-children, grand children and many loving family members and friends. Hello BR Friends: Sad to have to report that I received an email from Tom Scott that Mrs. Nancy “Mom” Scott passed away on July 24th. Tom wanted me to pass along that he was sorry for the delay in notifying us. Needless to say, I’m sure we can understand the personal and family issues that can account for this in their sad time. She passed at the age of 86, leaving behind daughter Barbara (Scott) Andrezjewski, sons Tom, Bob, George, and Terry, and 9 grandchildren. All four of her sons were Blue Rock corps members, as were two daughters-in-law; Kathy (Gant) Scott, wife to Tom, and Peggy (Broomell) Scott, wife to Bob. As if raising those four sons weren’t enough, she was also “Mom” to the rest of us. As Tom notes, she made a lot of sacrifices for her boys to be in the corps, and we all know she was there for the rest of us as well. Besides an official role as Secretary, collecting dues, taking attendance, keeping member contact information up to date, and keeping track of member tour accounts, she was always there taking care of uniforms, sewing on buttons, tending to cuts, bruises and sunburns --- not to mention cheering us on from the sidelines. Now she joins those others of our Blue Rock family who have passed on. And as surely as we will all someday be marching in Blue Rock Eternal, you can know that she will be there on the sidelines, never flinching, and cheering us on. We were all her children, and she was “Mom” to all of us. TYLER, William C. Age 59, of Maple Shade passed away on Thursday July 2nd, 2009. Born in Camden he lived in Runnemede before moving to Maple Shade 18 years ago. Son of the late William Tyler, brother of the late Beverly DeFiore, he is survived by his loving daughter Sarah Tyler of California, his dear mother Iona Tyler of Maple Shade, his sisters Tobey Schwartz and Debbie Lesher both of Allentown, Pa., brother Brian (Maureen) Tyler of Cherry Hill, and many nieces and nephews. Funeral service were held on Tuesday July 7th, 10AM at the MARK C. TILGHMAN FUNERAL HOME, 38 N. Forklanding Rd, Maple Shade. Interment-Colestown Cemetery. Patricia "Pat" Gallaway, age 57, of Newark, died August 7, 2007 at Jeanes Hospital in Philadelphia. She attended St. Ann's Elementary School and graduated from Wilmington High School. She worked as an administrative assistant in the Wilmington area for many years. She was a former member of the Blue Rock Drum & Bugle Corps. She was predeceased by her parents. She is survived by daughter, Laura Green-Gallaway at home; sisters, Sue Nagy, Maggie Eduardo and Kate Blanke; beloved sister and best friend, Maureen "Moe" Konizer; and brother, Mike Gallaway. She is also survived by her pets, Scruffy and Annabelle. Along with his parents he is predeceased by a son, Thomas H. Elliott, III (PeeWee) - who also marched with Blue Rock. Craig Pyle, 34, a 1978 graduate of Christiana High School who was diagnosed with AIDS two years ago, died Friday of complications from the disease in West Jersey Hospital, Marlton, NJ. Raised in Glendale, Bear, he played saxaphone in a jazz group and clarinet in marching band. From age 14, he performed throughout the country with the Blue Rock Drum and Bugle Corps including at Disneyland and in Midwestern competition. After graduation, he became a salesman at Maple Shade Mazda on New Jersey 73 and was sales manager for six years until becoming disabled in July.